SAN FRANCISCO, CA -- (Marketwire) -- 06/04/12 -- THE MELT, an innovative and fast-growing Bay Area casual eatery, will start serving breakfast at 7 a.m. beginning today. The menu will offer a new take on classic breakfast favorites using high-quality, honest ingredients cooked and ordered using proprietary technology. 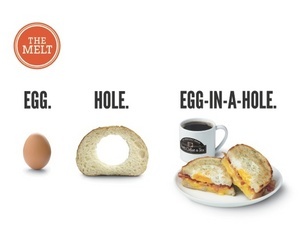 The Egg-In-A-Hole Melt is made to order with a fresh-cracked egg. The steel-cut oatmeal is slow cooked in THE MELT's signature copper kettles. Premium-quality coffee and tea from Peet's Coffee & Tea® is brewed fresh, and rounds out the wholesome breakfast menu. Breakfast will be served from 7:00-10:30 a.m. at its three San Francisco locations; visit melt.com for store locations. "Customers have been asking for a fast, high-quality, and memorable breakfast," said Jonathan Kaplan, founder and CEO of THE MELT. "As the most important meal of the day, we've committed to exceeding their expectations with a menu that is made to order in under three minutes, and tastes just like you remember, only better!" Customers can order breakfast online or via their smartphone, receive a QR code, and scan it at any of THE MELT's San Francisco locations before 10:30 a.m. Unlike other mobile ordering systems, THE MELT won't start the order or charge the customer before the QR code is scanned so the melt is always fresh and hot. THE MELT will continue its expansion, with several more Bay Area restaurant openings in 2012, starting this summer with a Berkeley location. The growth of THE MELT is fueled by a solid management team led by Flip Video founder Jonathan Kaplan, and a top-tier board of directors including Ron Johnson, former head of retail operations at Apple and current CEO of JC Penney; acclaimed chef and restaurateur Michael Mina; Michael Moritz of Sequoia Capital; and Bruce Dunlevie of Benchmark Capital. Headquartered in San Francisco, California, THE MELT is a fast casual restaurant business that specializes in high-quality grilled cheese sandwiches and seasonally fresh soups. Created by entrepreneurial Flip Video founder, Jonathan Kaplan, THE MELT is reinventing the fast casual restaurant experience. Plans call for a rapid expansion of THE MELT, with multiple locations opening in 2012. For more information, visit http://melt.com. Like us on Facebook and follow us on Twitter. For more information about Peet's Coffee & Tea, visit www.peets.com.